WOW! Excellent... Love it - real dreamy/nightmarish quality about it that I relate to. Well captured. Fun stuff, there is a very interesting noise effect that makes it look like the sky is a big backdrop on cardboard or something. Must be really big because that bridge looks real. Giving it that 8 second exposure really works to give the water a really amazing quality. Would it be excessively niggling details to have that road sign sliced off the left edge by means of a crop? I think it would be a small enough slice to not affect anything overmuch. Fantastic results on the edge glow from the back-lighting. wow...what a great shot...it reminds me of some sort of twisted christmas shot! Damn! It's like Matt's mind is in a time-warp. Great job, Joey! God you're such a prick. I hate you. Your best image ever is now in my favorites. One of your best IMHO. Seems unreal and very stylistic/film quality. Added to my favs! I love the lights and the positioning of the man. As usual, an excellent photograph all around. 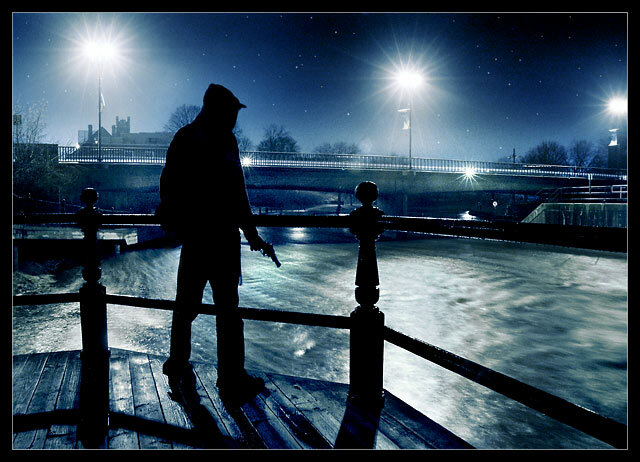 The composition is spot-on, the silhouetted figure adding drama in spite of the gun, the exposure offering a sense of movement in the water that balances, in my opinion, the rigidity of the sharp lines in the figure and the bannister. The effect on the streetlamps and the fact that you were able to capture (I assume) stars in this picture really heighten the drama. (edit: oops, just read comment below) The duotone effect is pretty much perfect for this type of scene. Even the heavy border that reflects the bannister shadows is the right choice. I can't say anything much "critical" about this image, except to offer my personal taste. The elements that aren't trees over the bridge detract, but ever so slightly, and not enough to complain. There is a breakup of detail on the bannister highlights that I only notice because of close examination. Nit-picky stuff. A higher resolution would have me really gaping at this. Congrats. Everyone could learn something from you, in my opinion. Message edited by author 2006-04-03 13:20:54. Great lighting and exposure, and very nice processing. Were the stars added in post processing or were they in the shot? settle down there big boy..
Joey....you rock my world. That is just Phantasmagoric. Damn - how did I know it was yours? I LOVE it. Great moody shadows. Just enough contrast to tell the story. Is that an air soft??? Great picture, but whats the gun for? Edit: Nevermind..I just read your title! Message edited by author 2006-03-31 22:58:54. Proudly hosted by Sargasso Networks. Current Server Time: 04/20/2019 10:23:10 PM EDT.